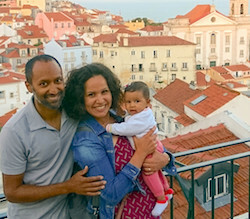 From Ravindra: After years of online dating using mainstream sites I tried Natural Awakenings Singles and quickly found Houneida in October 2014 who was living in Athens, Greece. All she wrote on her profile was “I am ready and willing to co-create a conscious partnership full of play, adventure, and personal growth! Would you be willing to embark with me?” Instantly, I was intrigued and accepted her challenge by sending her a message. Within a few days of emailing on the site we started video chatting and I took her on a "virtual date". She then asked, "When are you going to take me on a real date?" Two and half months later, I flew to Athens to meet her in person take her on our first real date. She is everything I was looking for and more – a conscious, compassionate, kind, capable, and funny woman! After that, we saw each other every few months either in Greece or USA and we also traveled to India together. A year after our first meeting I proposed to her in Vienna, Austria and eleven months later she moved to Michigan and we got married. Recently, we welcomed into the world our daughter Maya and we've never been happier or more fulfilled. I'm grateful for this online network that facilitated our meeting each other and growing together as a family. From Houneida: After years of being involved in bad relationships and after a hurtful break-up, I decided to start looking within and resolve my own issues. It took me a year and half of digging deep into myself and doing some healing work. One day, I stumbled upon an interview with Jill Crosby, the founder of Spiritual Singles website, so I thought why not give it a try and put myself out there? Why would I limit myself to men who are only within my geographical area? I signed up and I am so glad I did! I created a very short profile in no time but to the point. Within a week Ravindra contacted me, we exchanged a couple emails, and that's it! We found each other and we connected right away. When people ask us how we met I like to reply "in the field" or sometimes I say in the “box" referring to the computer (trying to be funny...). I would like to mention one thing about our actual "physical" date when he came to meet me in Athens. He took me to a fancy restaurant with live piano music and this breathtaking view of the Parthenon lit at night. Everything about the place was great but the best part was its name. It was called "Strofi" which means turning point or curve. It was indeed! My life has changed ever since I met him. We were both ready to meet each other and have our trans-Atlantic loveship (as we like to call it). Your website was the channel that facilitated it all. We are beyond grateful for your role in this. Oh, he proposed in Vienna after a daylong treasure hunt with a theme of the five senses. I got to fly in a helicopter to SEE the mountains around Vienna, SAVOR/SMELL some divine confections with wildflower petals and the famous Viennese Sachertorte. The SOUND was missing though, since the piano performance was cancelled. However, this did not change a thing about the whole experience. I was exhausted running from one place to another and my boyfriend being mysterious not revealing a thing about what was going on until we arrived at the Belvidere Palace. In front of “The Kiss” painting by Klimt there was the ultimate TOUCH experience – me trying to fit a tight ring on my finger. He suggested taking it back for resizing but I did not let go of it once I got it…no way!!! It was beyond my wildest dreams! I never thought that a man like him even existed. I would ask him from time to time if he was real. It took me a long time to believe that what I was experiencing was real until our first fight…hahaha!!! This is just me, I like to be funny! I am so grateful for him, your website and my beautiful daughter Maya. P.S. Thanks again to Jill for writing a letter to use as documentation of our online relationship for Houneida’s fiancée visa application! NOTE: Natural Awakenings Singles and Spiritual Singles are part of the Conscious Dating Network which is comprised of many "Spiritual/Conscious/Mindful" and "Green/Eco-Conscious" dating sites that all share the same large database of members (like different rivers flowing into the same ocean). New members only need join one site to have access to all members from all sites.